The newest member of Cherry Hill Township Council, Michele Golkow (third from left) flanked by her son, David, Mayor Chuck Cahn, husband Curt, daughter Shayna and Council President David Fleisher. Taken moments after her swearing-in at the latest council meeting on April 8. A Cherry Hill resident for a quarter-century who possesses a long history of service to the community, Michele Golkow was officially welcomed as the newest member of township council at its most recent meeting. Golkow, flanked by her family, was sworn in by former Cherry Hill Mayor Susan Bass Levin, who served in that post from 1988 to 2002. Golkow had been one of three choices submitted by the Cherry Hill Democratic Committee to replace Melinda Kane, who resigned her council seat late last month to take an open seat on Camden County’s Board of Freeholders. Greg Bruno and John Diszeghy were the other two nominees. With her appointment to the open council post, Golkow’s community leadership continues on a larger stage. She had previously served as immediate past president of Temple Beth Sholom, had been a past president of Jewish Family and Children’s Services of Southern New Jersey and remains a current member of its Advisory Council. Golkow had also spent time as a board member of the nonprofit Uplift Solutions, which provided support to businesses and local government in generating access to healthy, fresh foods in underserved communities. “To the people of Cherry Hill: I promise to represent you with integrity, with honesty and with openness. As terrific as Cherry Hill is, there’s always room to do more. It’s my turn to give back to the community that has given so much to me and my family. 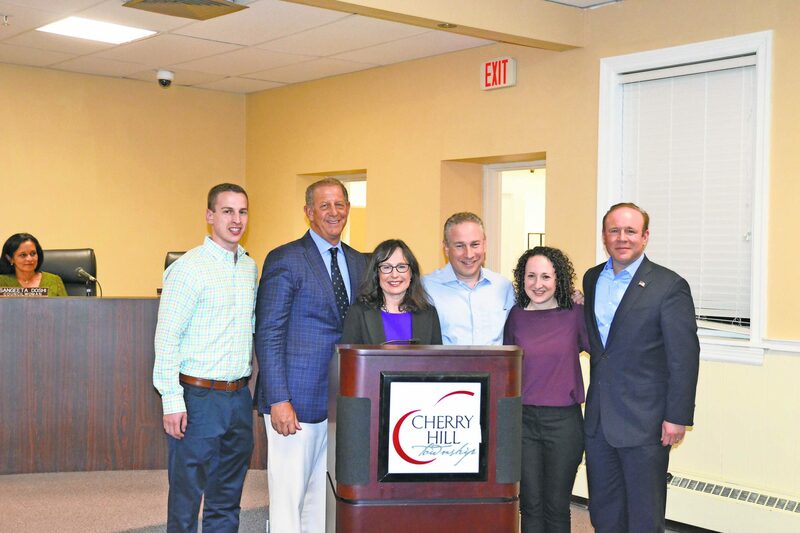 I am excited to continue making Cherry Hill a welcoming township where families can live, work, learn and thrive,” Golkow said following her swearing-in. Golkow and her husband Curt are the parents of two children, son David and daughter Shayna. Both attended Stockton Elementary School, Beck Middle School, and Cherry Hill High School East. A graduate of the University of Maryland as well as Penn Law, she practices law at Ballard Spahr in Philadelphia, specializing in employee benefits. “My approach in my community service work through the years is a collaborative one; listening to people with diverse opinions carefully and striving to build consensus to try and achieve the best outcomes and to solve problems. I am committed to continuing this inclusive and collaborative approach as a township councilwoman. I believe government works best when it is open and accessible to all, bringing people together who have different perspectives,” Golkow continued in her remarks. Golkow took her seat on the dais with fellow members of council, but abstained in all votes on agenda items. In moving a step closer to the creation of affordable housing, council approved upon second reading, Ordinance 2019-5. The ordinance authorized the purchase of existing structures as 110 Park Place Drive and 506 Park Place Drive by the township for inclusion into the Affordable Rental Housing at Tavistock program, which will be funded by the Home Investment Partnership Program. These programs aim to provide rental units to low- and moderate-income residents. According to language in the ordinance, the township has authorized payment not to exceed $230,000 for the purchase of both properties. Members of Cherry Hill High School East’s middle-school and varsity boys ice hockey teams were honored by council and given proclamations for their respective performances during the 2018-19 season. The former club finished its campaign 22-0, the first in school history to finish a season undefeated, while the latter claimed its third consecutive Tier 2 crown in the South Jersey High School Hockey League, finishing the postseason with a 4-0 mark. Council passed a resolution granting a redemption amusement games license for CEC Entertainment and Chuck E. Cheese, located adjacent to the Cherry Hill Mall.